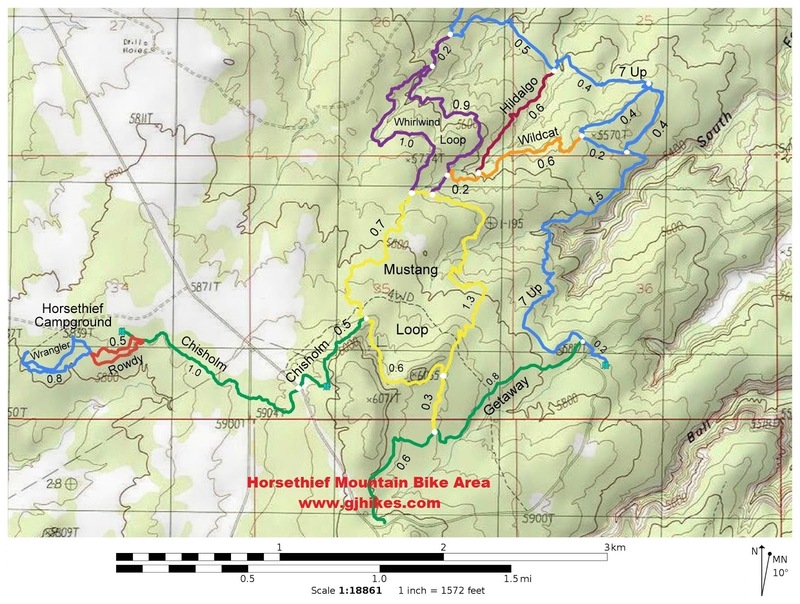 The Whirlwind Loop is part of the Horsethief Mountain Bike Trails area near Moab, Utah. 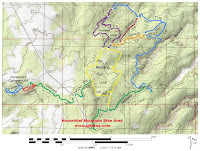 The trail begins off of the Mustang Loop where it follows a course around the northern end of the Horsethief area before reconnecting with the Mustang Loop a few hundred feet from where it began. A short spur off of the Whirlwind Loop connects to the 7-Up trail and near its end it is connected to by the Wildcat trail. The Whirlwind Loop begins at the 0.83 mile point of the Mustang Loop measuring from its junction with the Chisholm trail. Beginning here will take you around the loop in the clockwise direction. If you would like to go in the opposite direction then stay on the Mustang Loop for about another 500 feet to where the other end of the Whirlwind Loop connects. The trail begins along the sandstone bench of a rocky outcrop. Little ledges seem to line themselves up like they have always been waiting for someone to build a trail over them. The route was well engineered to take advantage of the natural terrain. Purple stripes mark the route as it cross a large slickrock dome. From here you can see past the neighboring Navajo Rocks Mountain Bike area where the buttes of Monitor and Merrimac are part of the scenic background. No good ledge shall go unused. A choice of routes allows you to pick between a roll or a jump. At the 1.07 mile point a short spur that is just under 2 tenths of a mile long leads down to the 7-Up trail. For something different to do you can ride out to the 7-Up trail and use it to get around to the Hildalgo, Wildcat or even the Gateway trails. The trail continues its scenic course as it heads back toward the Mustang Loop. At the 2 mile point the Wildcat trail breaks off on the left. The Wildcat trail runs from here up to the 7-Up trail which is less than a mile away. From the Wildcat trail it is less than a quarter mile to the finish. It is all uphill but with a little speed you can blast right over the bumps. The Whirlwind Loop has a good solid base for the most part without a lot of loose rock or loose dirt. It can make for a fast track so maybe that is why they call it the Whirlwind. If you would like to see it for yourself then all you have to do is grab your bike or 'Take a hike'.